Wasps are drawn to sugary, sweet foods and liquids. These include sodas, fruit juices and the sugary syrup used in hummingbird feeders. If you make your own syrup for wasps, you can use it as bait in wasp traps. The wasps will be drawn to the scent of the syrup and will become stuck in the trap. Making a syrup for wasps can help alleviate a wasp problem in your yard so you can enjoy it during wasp season. 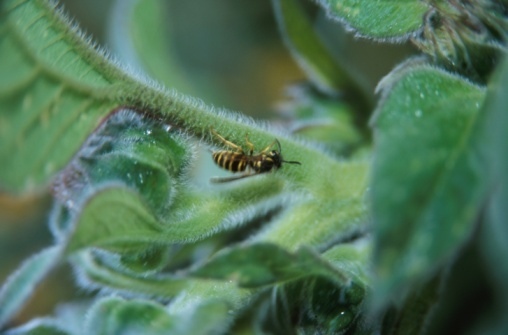 Wasps are a common garden pest. Pour 4 cups of water into a soup pot. Put the pot on the stove over high heat and bring the water to a boil. Pour in 1 cup of regular white sugar. Stir the mixture until the sugar dissolves. Lower the heat to a simmer. Let the sugar water simmer for five to 10 minutes, stirring every two minutes so the syrup does not stick to the pot. Take the pot off the heat as soon as the syrup is thick enough to coat a spoon and not run off quickly.